No matter what happens over the next couple of seasons, I will always be a fan of the trade. 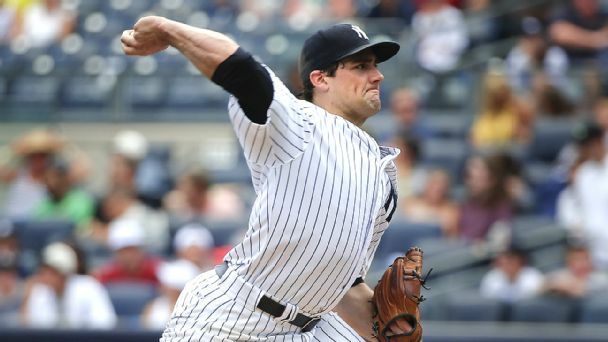 The transaction in question is the December 19th, 2014 deal that brought Nathan Eovaldi, Garrett Jones and Domingo German to the New York Yankees with Martin Prado, David Phelps and cash heading to the Miami Marlins. The centerpiece of the move was the then-24 year-old Evoladi, a right-handed flame thrower who was originally drafted by the Los Angeles Dodgers. He led the Yanks with 14 wins in 2015 but missed the last month of the season with an elbow injury. Eovaldi is about to start his fifth full season in a Major League uniform and though he is still relatively young, we are left to wonder: is this the year he puts all of it together or is he destined to not live up to his potential? It bears repeating: this was a tremendous trade by the Yankees. They were committed to getting younger and at the same time remaining competitive. Prado is a good, versatile infielder, the kind of player New York could have used while Chase Headley and Stephen Drew struggled at times. How often, though, you are able to secure a young starting pitcher who can hit 98 MPH with his fastball? Prado is now a free agent at the end of 2016 meaning the old Yanks would have kept him until the end of his contract. General Manager Brian Cashman recognized the need to get younger and more athletic. The acquisitions of Eovladi and shortstop Didi Gregorius bear that out. They also got a chance to do something else that is not normally associated with the Yanks: get cheaper and get the same amount of production as if they had brought in more proven veterans. The biggest issue for Eovaldi is consistency. He can be downright brilliant such as on August 24th against the Houston Astros when he shut out Carlos Correa and company for eight innings, allowing four hits and three walks while striking out seven. However, in his next start against the woeful Atlanta Braves, Eovaldi lasted only five innings, surrendering five earned runs on eight hits with two walks. Those 14 wins in 27 starts were impressive but they came in only 154 1/3 innings, an average of less than six frames per start. He allowed 175 hits and 49 walks in 2015 and his lifetime WHIP (Walks Plus Hits Per Innings Pitched) is 1.397. He has made 30 or more starts in a year once, in 2014 which is also the year he came closest to hurling 200 innings in a single campaign at 199 2/3. He underwent the dreaded Tommy John surgery during his Junior year of high school so needless to say, his injury at the end of the season caused many anxious moments. If the Yankees are to make another trip to the playoffs in 2016, Eovaldi has to become more steady from outing to outing. They need him to make more than 30 starts and pitch over 200 innings given the questions that linger over the rest of the rotation. If he can show any kind of consistency, then he could remain a member of the Bombers’ rotation for years to come. If not, don’t be surprised if his name surfaces in trade talks as 2017 represents his final season of club control.